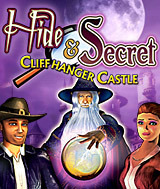 Will and Anna are off on an adventure of derring-do in Hide & Secret: Cliffhanger Castle! Embark on a whirlwind tour of the globe to uncover hidden clues while converting an old castle into a museum. You´ll be on the edge of your seat as you summon the wizard Merlin and then venture deep into the legends of King Arthur. Hold on tight for a seek-and-find thrill ride that will keep you guessing. You won´t believe the ending! Comments: The graphics are only fair so finding objects can be a challenge. Hints are limited but luckily there's no timer to put the pressure on. The dialog is weak making the hero out to be an idiot (he thinks Camelot is a place to buy camels and never heard of New York being referred to as the Big Apple-he wants something to eat more than a big apple). I guess it's all for humor. The story is poor to start as they're jumping all over the place. Hopefully they'll settle down some place soon and make a decent story. I recommend this game only for the fanatic of the hidden object genre. Comments: Will and Anna are at it again. This time they are on a mission with Merlin the magician traveling the world in this hidden object game. They are looking for clues to help convert a castle & build a museum. The storyline is great but if you want to really have fun you need to play it. This game is fun for all give it a try.